What are Common Short-Term Effects? Will it Affect Me Mentally? Marijuana is one of the most widely used drugs in America, second to alcohol and tobacco. Unlike alcohol and tobacco, marijuana is currently illegal in most jurisdictions because of the perceived harm it has on the human body and mind. Despite common belief among users, marijuana does have harmful short-term and long-term effects. When you smoke or otherwise consume marijuana over long periods of time, it can wreak havoc on your body and brain in ways you would not expect. There is even the possibility of addiction if enough marijuana is consistently used. Marijuana’s effects are reported among users to include sensations of euphoria, relaxation and, in some cases, elevated awareness. Marijuana is a popular recreational drug due to the “high” it brings about in users. Historically, along with other cannabinoids and hallucinogens, it has been used by tribal cultures to induce spiritual or religious experiences. The modern-day religion of Rastafarianism is thought to associate itself with the marijuana culture. In 2004, the United Nations Office on Drugs and Crime reported that 0.6 percent of adults worldwide used cannabinoids every day. Marijuana has multiple methods of consumption other than smoking. It is often baked into dessert items like cookies or brownies. The long-term effects of marijuana on the body primarily include respiratory disorders. This is because most people use marijuana by smoking it via joints or cigarettes. Inhaling any type of smoke into the lungs is linked to lung cancer, despite the fact that marijuana smoke is sometimes believed to be less dangerous than tobacco smoke. The reproductive system can also suffer in both males and females due to marijuana addiction. The detrimental effects on sperm occur because there is a receptor in sperm cells that reacts to the presence of THC. In addition, a 2007 study reported that men who smoked marijuana weekly were at 70 percent more risk of testicular cancer than men who did not smoke or smoked very little. The cannabis plant is native to the Middle East and the Indian subcontinent. Chronic consumption of cannabis can cause long-term complications. Some possible effects when used regularly over a period of years include depression, anxiety and psychosis. Marijuana’s effects can be deceptively benign, only to accumulate over time and cause real problems for the user. “Although marijuana is not commonly thought to be addictive, it can cause withdrawal effects if the person suddenly stops using it.”Although marijuana is not commonly thought to be addictive, it can cause withdrawal effects if the person suddenly stops using it. Some effects associated with withdrawal include anxiety, irritability, depression, overall decreased appetite and mild tremors; however, most of the withdrawal effects are psychological. There is little, if any, physical withdrawal from marijuana, as it is not believed to be physically habit-forming. Psychological addiction, however, can be just as difficult to overcome, requiring that behavioral therapy be administered. Another aspect of marijuana addiction includes a fixation on the means used to take the drug, such as a pipe. This further reinforces the idea that marijuana is psychologically addictive when used chronically. The first aspect of marijuana addiction treatment involves detox. This means stopping use of the drug and letting the body rid itself of it. Marijuana is fat-soluble, so it stays in the body for 30 days after use. Therefore, users can expect to spend up to a month in the detox phase of treatment, depending on whether there may be other drugs in the body that compound the effects of marijuana. 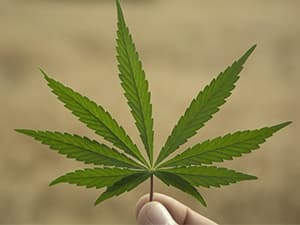 People who are admitted to inpatient rehab facilities rarely have marijuana as their only drug of choice; it is commonly thought to be a gateway drug. Because the effects of marijuana on the body include altered perceptions and psychological addiction, a period of psychotherapy is often necessary to overcome addiction. This involves teaching the patient the dangers of excessive marijuana use, learning healthy stress management techniques (people often use marijuana as a form of stress relief), and encouraging the development of constructive hobbies. Call 1-888-287-0471	Who Answers? to learn more.